Saturday evening we went out to a tapas place we've been to a couple of times already. The food was as good as ever but going on a busy night really changed our perception of the place. We may as well had never been there before, it was completely different experience. It's not necessarily a bad thing, just interesting when things like that happen. It had been raining on and off all day, the humidity was crazy, but I had this outfit on my mind all week. 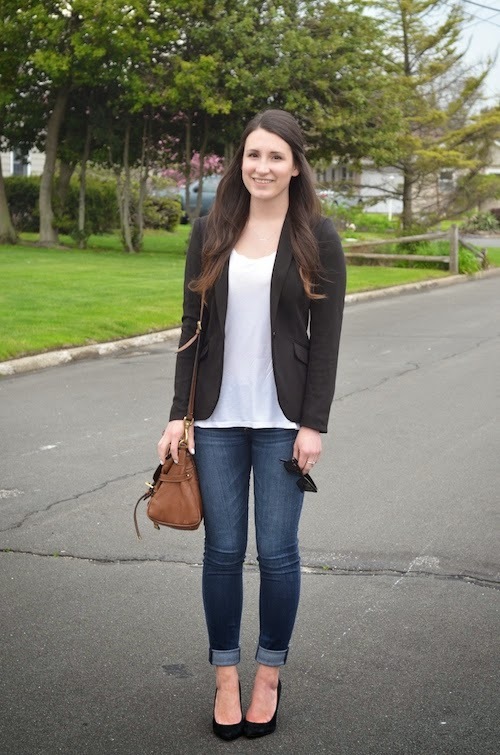 Jeans and a simple white tee, dressed up with a blazer and suede heels. It had been such a snowy / wet winter that I didn't really get a lot of use out of these heels and I wanted to wear them. I took a chance and wore them any way. Luckily, the rain did end up holding off! Love how that Abercrombie jeans fit on you!